This chapter addresses the situation in Myanmar, a country now facing acute human security challenges in the course of historical reform. The stakeholders mentioned such pressing issues as environment and climate change, urbanization, migration, peacebuilding, and poverty reduction. 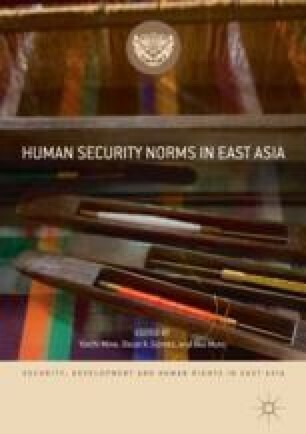 The author argues that the “Japanese approach” to human security will work well in the Myanmar context where building a culture of trust among different interest groups is at stake. The ASEAN and its development partners can leverage ASEAN’s constructive engagement mechanisms in pursuing human security in Myanmar, as demonstrated by the relief operations during Cyclone Nargis in 2008. The model of consultation developed during that crisis may be applicable to ending the Rakhine communal clashes and the resultant exodus of Rohingya refugees. Aung, San Suu Kyi. 2018. Democratic Transition in Myanmar: Challenges and the Way Forward. https://www.iseas.edu.sg/images/43rd-Singapore-Lecture-Speech-by-Aung-San-Suu-Kyi-Final-transcript.pdf. Accessed 30 Aug 2018. Chongkittavorn, Kavi. 2016. Myanmar to Brief ASEAN Amid Alarm over Rakhine. http://asia.nikkei.com/Politics-Economy/International-Relations/Myanmar-to-brief-ASEAN-amid-alarm-over-Rakhine. Accessed 10 Jan 2018. Corben, Ron. 2017. Myanmar Refugees in Thai Camps Face Repatriation Challenges. https://www.voanews.com/a/myanmar-refugees-thai-camps-repatriation-challenges/3847329.html. Accessed 11 May 2017. Green Economy Growth. 2018. Draft Extended Summary Highlights. http://geggmyanmar.org/draft-extended-summary-highlights/. Accessed 9 Mar 2018. Htut, Ye. 2016. Myanmar’s Long Journey to Peace Starts at Panglong. http://www.straitstimes.com/opinion/myanmars-long-journey-to-peace-starts-in-panglong. Accessed 31 Aug 2016. ———. 2017. Myanmar’s Elusive Dream of Peace. https://www.iseas.edu.sg/medias/commentaries/item/5479-myanmars-elusive-dream-of-peace-by-ye-htut. Accessed 1 June 2017. ICRC (International Committee of the Red Cross). 2018. Myanmar: Six Months on into the Rakhine Crisis. https://www.icrc.org/en/document/myanmar-six-months-rakhine-crisis. Accessed 18 Mar 2018. IOM (International Organization for Migration). 2015. Myanmar. http://www.iom.int/cms/en/sites/iom/home/where-we-work/asia-and-the-pacific/myanmar.html. Accessed 6 Jan 2015. Lee, Yimou. 2017. China Draws Three-Stage Path for Myanmar, Bangladesh to Resolve Rohingya Crisis. https://www.reuters.com/article/us-myanmar-rohingya/china-draws-three-stage-path-for-myanmar-bangladesh-to-resolve-rohingya-crisis-idUSKBN1DK0AL. Accessed 27 Nov 2017. MacDonald, Connor, and Phyu Thiha-Cho. 2016. Rapid Migration and Lack of Cheap Housing Fuels Yangon Slum Growth. https://www.irrawaddy.com/news/burma/rapid-migration-and-lack-of-cheap-housing-fuels-yangon-slum-growth.html. Accessed 15 Dec 2016. Mar, Aye Aye. 2014. Violent Standoff Continues at Myanmar Mine Protest. http://www.voanews.com/content/violent-standoff-continues-at-myanmar-mine-protest/2570915.html. Accessed 25 Jan 2014. Mang, Lun Min. 2016. Pilot Census Lays Groundwork for Citizenship Verification in Rakhine. http://www.mmtimes.com/index.php/national-news/20746-pilot-census-lays-groundwork-for-citizenship-verification-in-rakhine.html. Accessed 10 June 2016. MM Business News. 2014. Myanmar Spends the Least for Education Among ASEAN Countries: AAM. http://mmbusinessnews.blogspot.sg/2014/03/myanmar-spends-least-for-education.html. Accessed 30 Mar 2014. Mon, Kyaw Hsu. 2014. $22 Mn in ADB Programs to Reduce Poverty, Improve HIV/AIDS Care. http://www.irrawaddy.org/burma/22mln-adb-programs-reduce-poverty-improve-hivaids-care.html. Accessed 15 July 2014. Mon, Ye. 2016. Officials Deny Squatter ‘Census’. http://www.mmtimes.com/index.php/national-news/yangon/20929-officials-deny-squatters-census.html. Accessed 25 Dec 2016. Mooney, Paul. 2014. Myanmar Students Protest Against Education Law for Third Day. http://www.reuters.com/article/2014/11/16/us-myanmar-protest-idUSKCN0J00MD20141116. Accessed 29 Nov 2016. NLD (National League for Democracy). 2015. 2015 Election Manifesto. http://www.burmalibrary.org/docs21/NLD_2015_Election_Manifesto-en.pdf. Accessed 10 Feb 2018. Nippon Foundation. 2013. Yohei Sasakawa named Japan’s Special Envoy for National Reconciliation in Myanmar. https://www.nippon-foundation.or.jp/en/news/articles/2013/1.html. Accessed 20 Feb 2016. ———. 2017. Projects in Myanmar. https://www.nippon-foundation.or.jp/en/what/projects/myanmar/img/5.pdf. Accessed 30 Nov 2017. Nitta, Yuichi. 2017. Rohingya backlash pushes Suu Kyi toward Beijing. https://asia.nikkei.com/Politics-Economy/International-Relations/Rohingya-backlash-pushes-Suu-Kyi-toward-Beijing. Accessed 30 Nov 2017. Nitta, Yuichi, and Thurein Hla Htway. 2018. Two Ethnic Groups in Myanmar Sign Ceasefire. https://asia.nikkei.com/Politics-Economy/Policy-Politics/Two-ethnic-groups-in-Myanmar-sign-ceasefire. Accessed 21 Feb 2018. Obuchi, Keizo. 1998. Toward the Creation of a Bright Future for Asia. http://www.mofa.go.jp/region/asiapacific/asean/pmv9812/policyspeech.html. Accessed 30 Dec 2014. Than, Tin Maung Maung, and Moe Thuzar. 2012. Myanmar’s Rohingya Dilemma. https://www.iseas.edu.sg/images/pdf/ISEAS_Perspective_9July2012_Issue_1.pdf. Accessed 25 Oct 2017. Thant, Htoo. 2017. Defense Expenditure Ranks Third in 2017–18 Union Budget Proposal. https://www.mmtimes.com/national-news/nay-pyi-taw/24755-defence-expenditure-ranks-third-in-2017-18-union-budget-proposal.html. Accessed 10 Feb 2017. The Economist. 2014. Kidnapped. http://www.economist.com/news/business/21602719-chinese-miner-tries-be-nice-kidnapped. Accessed 10 June 2016. Thuzar, Moe, and Ye Htut. 2017. Honeymoon over, Suu Kyi Faces Fresh Challenges. http://www.todayonline.com/world/honeymoon-over-suu-kyi-faces-fresh-challenges. Accessed 28 Apr 2017. Thuzar, Moe, and Lex Reiffel. 2018. ASEAN’s Myanmar Dilemma. https://www.iseas.edu.sg/images/pdf/ISEAS_Perspective_2018_3@50.pdf. Accessed 29 Jan 2018. Toe Lwin, Ei Ei. 2014. Military Spending Still Dwarfs Education and Health. http://www.mmtimes.com/index.php/national-news/10000-military-spending-still-dwarfs-education-and-health.html. Accessed 30 May 2014. UNHCR (United Nations High Commissioner for Refugees). 2016. First Myanmar Refugee Returns From Thailand Under Way. http://www.unhcr.org/news/briefing/2016/10/580f1c0d4/first-myanmar-refugee-returns-thailand-under-way.html. Accessed 1 Dec 2017. UNOCHA (United Nations Office for the Coordination of Humanitarian Affairs). 2017. Rohingya Refugee Crisis. https://www.unocha.org/rohingya-refugee-crisis. Accessed 15 Dec 2017. ———. 2018. Rohingya Refugee Crisis. https://www.unocha.org/rohingya-refugee-crisis. Accessed 20 Mar 2018. Vatikiotis, Michael. 2017. Statesman Who Raised ASEAN’s Profile. https://asia.nikkei.com/Viewpoints/Michael-Vatikiotis/Statesman-who-raised-ASEAN-s-international-profile. Accessed 13 Dec 2018. Wee, Sui Lee. 2015. Myanmar Official Accuses China of Meddling in Rebel Peace Talks. https://www.reuters.com/article/us-myanmar-china/myanmar-official-accuses-china-of-meddling-in-rebel-peace-talks-idUSKCN0S22VT20151008. Accessed 10 Oct 2015. World Bank. 2017. Myanmar Poverty Assessment 2017: Part One Examination of Trends Between 2004/05 and 2015. http://www.worldbank.org/en/country/myanmar/publication/myanmar-poverty-assessment-2017-part-one-examination-of-trends. Accessed 15 Dec 2017. Yahya, Yasmine. 2018.ASEAN, Australia Doing Their Best to Help Myanmar Re-establish Stability in Rohingya Crisis. http://www.straitstimes.com/politics/govts-in-region-doing-their-best-to-help-myanmar-re-establish-stability-in-rohingya-refugee. Accessed 20 Mar 2018. Zarni, Maung. 2005. An Integrated Approach to National and Human Security Issues in Myanmar or Burma. http://www.freeburmacoalition.org/integratedsecurityapproach.htm. Accessed 10 Feb 2017. ———. 2013.Burma/Myanmar: Its Conflicts, Western Advocacy, and Country Impact. http://sites.tufts.edu/reinventingpeace/2013/03/25/burmamyanmar-its-conflicts-western-advocacy-and-country-impact/. Accessed 1 Jan 2015.